Is our subconscious mind really in charge? How many times have you noticed that you completed a task or arrived somewhere without thinking about how you achieved it? That’s your subconscious mind in action, making fast and automatic decisions with little or no conscious awareness of the decisions we make. Why does this occur? Research by evolutionary psychologists suggests that many of our subconscious and automatic responses relate to our instincts for survival. We do not act randomly or irrationally as some writers suggest. Indeed, research by Alex Pouget, Associate Professor of brain and cognitive science at the University of Rochester, discovered that people can make optimal decisions, but only if the choice is made by their sub-conscious mind. Our subconscious mind has a rational purpose, to protect us from danger and respond quickly without depleting mental energy. People don’t consciously decide to ignore advertising banners or stop to read the copy. These are decisions we automatically make to ease the process of navigating a site. They allow us to focus on what our brain decides are the more important tasks at that moment in time. This is not irrational, it’s what has made our species so successful. Unlike Kahneman, Pouget decided to avoid asking direct questions of people to determine how accurately they responded to problems. Instead, he studied the decisions that are made by our non-conscious brain and showed that in the vast majority of cases we make the best decision we can dependent upon the limited information available to us. Many decisions though are not solely reliant on our unconscious brain because our conscious and subconscious brains co-exist together. Further, our conscious mind (see System 2) is often triggered by visual and audio clutter, contextual issues and problems that require mental attention. This means that people have short attention spans and are very impatient. This has a significant impact on the digital user experience. Avoid clutter and competing calls to action to enable our sub-conscious brain to focus on achieving active goals. There are too many calls to actions and a poor visual hierarchy. Use visual cues to assist users find content or calls to action. Avoid flat design as this lacks the cues that users have become accustomed to seeing on a website. Follow established web conventions as these allow users to navigate from expectations set by their experience of other websites. This product page from Comms-express.com is probably one of the most cluttered pages I’ve come across. It has so much content that not all of it fits fully on the page. This will ring alarms with a visitor’s brain and cause System 2 to take control. What directs our attention to brands? A mass of psychological and cognitive research since the 1970s has shown the goals that direct much of our behaviour can be activated without a person’s conscious attention or choice. Indeed, experiments have shown that much of our cognitive processing is triggered without the conscious deliberation and control once thought to be necessary. Further, these studies also demonstrate that behaviour driven by goal achievement can also operate without conscious thought. This suggests our sub-conscious brain is hard-wired to automatically search for opportunities to satisfy psychological needs and make decisions that are in our best interest. It is at the very heart of our decision making. When our brain identifies a good opportunity it generates a positive emotion and the brain automatically seeks a decision to enable need fulfilment. Avoid over reliance on rational benefits as these may not get the attention of user’s subconscious mind. Always include implicit or psychological needs in your online communications as these grab attention more than purely rational benefits. Individual psychological goals are outlined later on in this post. 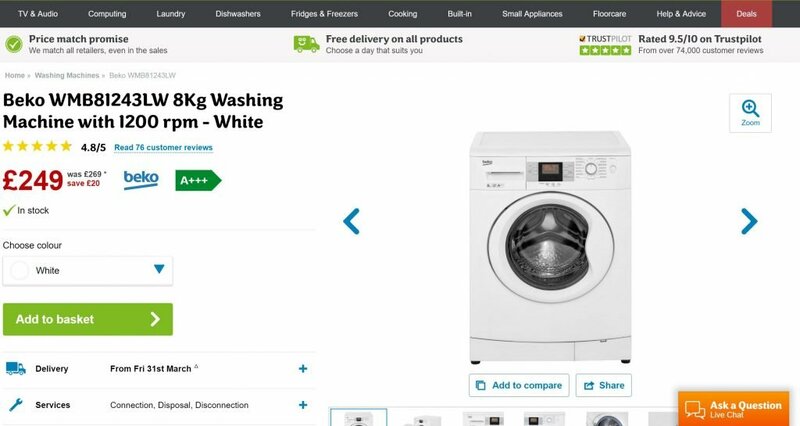 This example of a product page from AO.com is much cleaner and includes strong social proof messages using customer ratings and reviews. So how important are emotions when people are making decisions? The neuroscientist Antonio Damasio observed patients with damage to the ventromedial frontal cortices of the brain which controls our ability to feel emotions. The brain damage did not influence patients’ basic intelligence, memory or their capacity for logical thought. However, through a series of experiments Damasio found that the loss of their capability to feel destroyed a person’s ability to make decisions that were in their best interests. Damasio suggests that our thoughts mainly comprise images which include ideas, words, smells and real or imagined visual perceptions. Through our experiences these images become “marked” with positive and negative feelings. These feelings are associated (directly or indirectly) with bodily states. If a negative marker is associated with an image of an expected outcome it sounds an alarm and our brain will steer decisions to avoid that potential outcome. Damasio suggests that these emotional markers improve the accuracy and efficiency of our decision making process. ‘‘In short, somatic markers are … feelings generated from secondary emotions. These emotions and feelings have been connected, by learning, to predicted future outcomes of certain scenarios’’ (Damasio, 1994, p. 174). Use copy and images that convey strong emotions to encourage engagement and create momentum in decision making. People are less likely to make a decision about a purchase if they don’t feel strongly about your proposition. To encourage a positive feeling towards your brand consider using humorous images or copy to put users in a good frame of mind. Kahneman found that even getting people to smile improved their mood and how they responded to stimulus. Use images of positive outcomes on your website to reduce the risk of your content generating negative associations. How important is the sub-conscious mind? The evidence suggests that up to 95% of our purchase decisions are directed by sub-conscious mental processes. So, if the non-conscious and emotional part of our brain is so important to decision making why do we rely so much on engaging the conscious mind questions about our products and services? Does it matter if our customers say they like our website or our product if the non-conscious brain is driving behaviour? How do we target the sub-conscious mental processes that direct our attention and ultimately decide what we buy? Do we buy what we like or like what we buy? There is substantial evidence that the activation of the brain’s reward centre predicts purchases provided the pain induced by price is below a certain level. As an example, neuroscience research by Gregory Berns and Sara Moore from Emory University compared activation of the reward centre of teenagers who were listening to songs from relatively unknown artists with subjective likeability. By analysing sales of these songs over a three year period they were able to show that activation of the reward centre was much more predictive of future sales than subjective likeability. What this confirms is that it is the unconscious brain that directs much of our attention and not our conscious liking of a site or brand. Unless our communication engages with the non-conscious brain it probably won’t be noticed by the conscious mind. A purely rational argument may be completely ignored by the sub-conscious brain as it may fail to activate the brain’s reward centre. Emotionally engaging messages help us process information more quickly and improve the efficiency of our decision making. How do we target subconscious motives? Marketing consultancy, Beyond Reason, have combined the latest psychological and neuroscience research to develop a comprehensive model of implicit (psychological) motivations. As the evolution of the brain occurs over thousands rather than hundreds of years these psychological goals relate to basic human needs and social interaction. 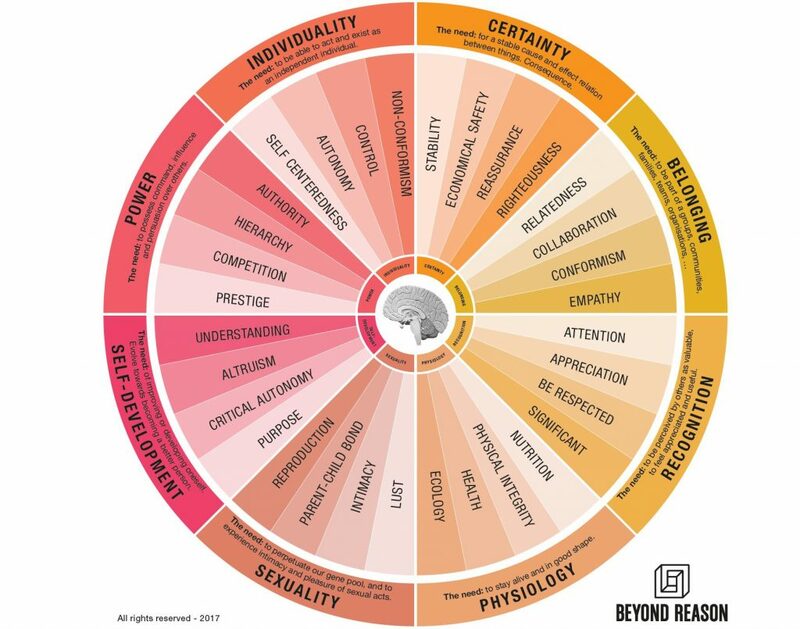 The Beyond Reason model has eight overriding implicit motivations which cover the areas of certainty, belonging, recognition, Individuality, power, self-development, sexuality and physiology. The model is summarised in this graphic and as you can see each motivation divides up into four individual categories. Beyond Reason use a form of the Implicit Association Test (IAT) to measure the relative strength of different psychological goals. As people are not fully aware of their psychological motives we cannot use traditional forms of market research that rely on self-reporting. Focus groups in particular can be highly misleading as people try to rationalise what brands or communications mean to them when in reality much of our mental processing is done by our subconscious. Identify what your visitors’ most important implicit motivations are to align your value proposition and communications with customer’s underlying needs. Airbnb for example, have created lifestyle experiences to emphasise how their proposition appeals to the desire to be a non-conformist. This may partly explain why the average Airbnb customer’s stay is significantly longer than your average hotel stay. Indeed, Airbnb’s own research suggests that many of their clients wouldn’t have gone on their trip if they hadn’t been able to use Airbnb. So Airbnb have actually grown the hospitality and travel market as well as disrupting some elements of the sector. 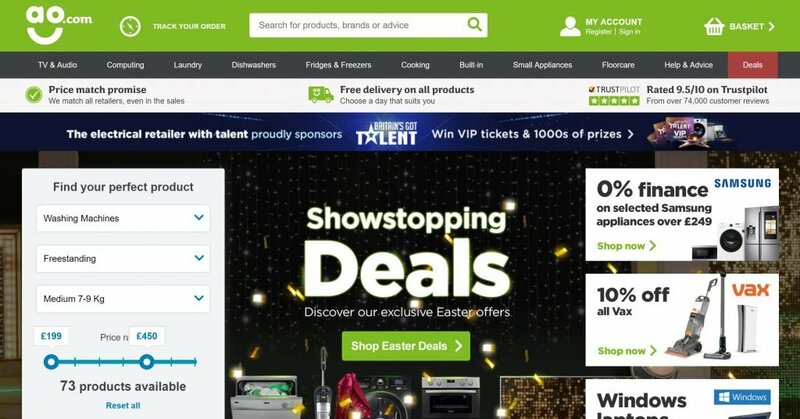 AO.com uses its sponsorship of the Britain’s Got Talent TV show to provide evidence of stability and certainty. People understand that sponsorship of a major TV show like BGT costs a lot of money and that it will take a long time for the company to get a return on their investment. This is known as costly signalling and demonstrates to people that AO.com are investing for the long term and plan to be a major player in their sector in the future. Attention, preferences and loyalty are most strongly driven by our unconscious mind. Visual and audio clutter on a screen can disrupt this process and lead to mental depletion. Emotions help people process information and make decisions faster and are involved in all our decisions. Communications that target subconscious goals are more likely to be effective than purely rational benefits as they tap into human emotions. Given the sub-conscious mind is responsible for most of our purchase decisions it is pointless asking people to rationalise brand preferences. Because of this focus groups are a misleading and inappropriate method of research. It is still necessary to have strong logical reasons to purchase your brand, but they need to be aligned to implicit goals. Because people are social animals the behaviour of others, including traditions and norms, can also heavily influence the perceived value and rewards from a brand. Finally, optimisers should aim to simplify the user experience to retain attention and build satisfaction and loyalty. Too many choices and complex decisions disrupt our subconscious decision making (System 1 thinking) and can result in mental depletion.